The Ray Goertz Award was established in 1985 to recognize outstanding contributions to the field of remote technology in hazardous environments. It honors the late Raymond C. Goertz for his lifetime contribution to the advancement of remote handling systems and for his development of the master-slave manipulator. 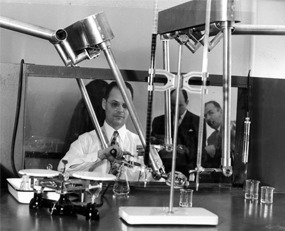 Starting with the planning of the first formal informational exchange meeting held in 1951, Ray Goertz was also instrumental in the founding of the Robotics and Remote Systems Division (RRSD), formerly known as Remote Systems Technology Division (RSTD). Nominees are judged by their contributions to the advancement and/or application of remote technology in hazardous environments. It is preferred that the nominator and nominee are members of RRSD but will be considered from non-ANS/non-RRSD individuals who have directly contributed to RRSD (e.g., papers, topical presentations). Division officers and committee members are not eligible during their terms in office. Nominations can be submitted at any time to the RRSD Honors & Awards Chair. To submit a nomination, complete the Nomination Form along with a 300-500 word summary explaining the qualifications of the nominee and his/her contributions to the field of remote technology in hazardous environments. A certificate of recognition and a $2,500 monetary award (based on ability to maintain funding) will be presented annually. Awardees are expected to attend the awards presentation. For more information or submit a nomination, please contact the RRSD Executive Committee Honors and Awards Chair.